Above: David Gomez in Taos, NM. Photography by Stefan Wachs. FOR YEARS, whenever I thought about going back home to Taos, it was easy to get hung up on change—the Walmart where the old drive-in theater used to be, favorite bookstores that have closed, old friends who have moved on. Some-times it seemed the Taos I grew up in no longer existed. I know better now. It’s still there. You just have to know where to look and what to look for. My Taos is not a world of art galleries, innovative cuisine, second homes, or a resort lifestyle. Instead, it’s strolling through the artisans’ displays of Indian jewelry, pottery, and other crafts at the San Geronimo Day feast on September 30, before the pole climb, after having gone down for the races early in the morning and then sitting down to a big meal at the family home on the pueblo. My Taos is about pulling up to Mante’s Chow Cart on the main drag and getting a chicharron burrito with red chile from the drive-up window. My Taos is a place where my father’s family has been for a thousand years. It’s about getting married in the little church at Taos Pueblo, where I am an enrolled member. I see travel articles about my town—“Ten Things to Do in Taos on a Long Weekend” (no exclamation point, but one is implied). After reading an article like that, I think: Wow—I don’t do any of that stuff. Maybe I should look into this “drinking champagne in a hot-air balloon” thing. But I don’t. I slip into town after getting a cup of gas-station coffee, avoiding traffic on the main road by taking side roads, headed toward family and friends. Living away, you start thinking about why you go home—to see your parents, to make sure there’s enough firewood at the house and that the truck is running all right, and to get a bowl of good red chile and a thick tortilla that puts the grocery store product to shame. The things I like to do in Taos have to do with the land and the water—cleaning a ditch, fixing a fence, hiking a favorite trail with my wife, or making a multi-generational wood run with two or three trucks, gathering enough piñon to supply the woodstove for long winter nights. Fishing the Río Grande at Pilar and other spots north of the Taos County line is a treat, with the river’s ever-changing moods and its variety of fish, from trout year-round to pike in the winter and smallmouth bass in the fall. I fish that river in my mind while sitting at my desk in Santa Fe, imagining myself swinging a streamer toward a rock and feeling the take. I have had a bald eagle stare down at me from his perch on the opposite bank as I worked likely spots, caught a fish or two, or slipped and fell into the water. I shared a pool along the highway below Pilar one evening with a blue heron. I fished the top part while the tall, stately bird watched the water intently, then bent over and stabbed violently at it with its long, pointed beak, spearing a fat 10-inch trout and showing me the difference between fishing for sport and fishing for food. 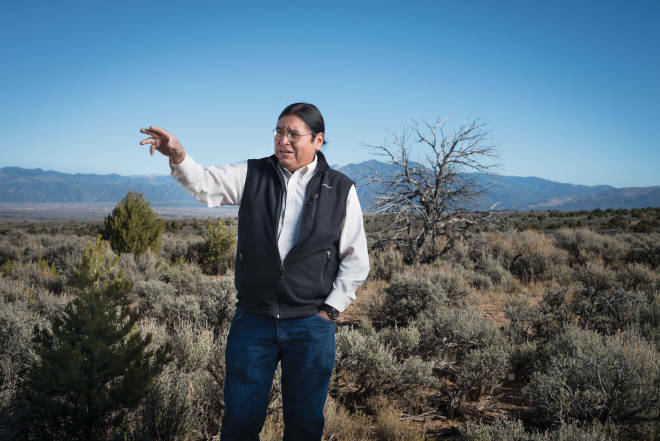 ALTHOUGH I SPENT MOST of my early life at Taos Pueblo and had access to the mountains above it, I really grew to appreciate federal public lands managed by the U.S. Forest Service and the Bureau of Land Management through summer jobs in high school with the Youth Conservation Corps and a work-study job in college. For two summers, I learned to read maps, worked on trails and fences, and roamed the Carson National Forest with a crew of other high school kids, under the guidance of Tommy Martinez, a coach and teacher with the Taos Municipal Schools. To this day I carry a pair of fencing pliers in the front driver’s-side pocket of my truck. Just in case. The BLM job was especially fun. On days when I did safety inspections and wrote permits for rafters at the top of the Taos Box at the John Dunn Bridge, I used to begin the day with a swim in the river, get out, dry off, put on my khaki shirt with the BLM patch, and start work. My co-workers and I ran the river at all stages, from the highest levels of the runoff to when the low flows of August required us to pull in the sides of the raft to squeeze through the rocks. Growing up in Taos in the 1970s was unique in that most rural towns are remote and isolated. The world came to Taos, however, flooding it with influences, possibilities, and ideas. Because of its counterculture appeal, we had a lot of members of the 1970s’ Lost Generation, plus some older beatniks and spiritual seekers of all ages. Few other places have so many characters. Growing up, I had a friend whose father was an astrologer and a fount of esoteric knowledge. Joseph “the Star Watcher” and his wife, Alice Rynear, were great friends and teachers. Rena Rosequist, former owner of the Mission Gallery, on Kit Carson Road, and a political mentor of mine, was a woman of rare grace and wisdom. Ken and Nancy Jenkins redirected teen drama into lavish high school productions, complete with prancing horses and a student orchestra. The late Susan Phillips, a poet and the mother of my artist/printmaker friend Alexandra Parks, encouraged my careers as a journalist and lawyer. My volunteer work with the New Mexico Music Festival in the late 1970s and early ’80s led to a long friendship with musician and composer David Amram. We went back for a bit in the late 1990s as a young family. My wife, Inez, had just been named editor of the Taos News (which published my earliest professional journalism in 1979 or so). I was a staff attorney at the Southwest office of the Western Environmental Law Center, and our son, Joaquin, went to the only day care in town—which cost more than my law school tuition. We ran with a bunch of young people from the district attorney’s office, the newspaper, and my firm, holding monumental dinner parties that probably disqualified a few of us from ever running for office. We lived close to my parents, and for Inez’s folks, the drive from their ranch in Mora County was not too bad. It was fun being at the center of a lot of things. We liked patronizing our friends’ and classmates’ businesses. When we needed gravel, we went to Sarah Medina at Medina’s, in Cañon. A former Taos High cheerleader, Marietta Santistevan, had an oil-change place we went to, Ms. Quick Stop. Our dining room set was made by an old friend, a former Spanish Market artist named Greg Flores, who went on to open Elevation Coffee, in El Prado, just north of Taos, and Espresso Fino, in Albuquerque. The family of my classmate Margaret Romero became our realtors, because we figured if anyone was going to make money off our transactions, it should be someone we knew. We never got around to buying a car from Debbie Jagers, at Friday Motors, although her husband was my dad’s pharmacist at the Taos Pueblo clinic. THINGS CHANGED IN 2000, when I went into private practice with a firm and we moved to Santa Fe. The focus of our lives shifted as our child and our parents got older. Our responsibilities increased at work as I made partner and Inez became the magazines editor and editorial page editor for the Santa Fe New Mexican. We made it back for important events like San Geronimo Day and Santa Cruz Day. We had a near-ironclad commitment to be at the pueblo for the bonfires and procession on Christmas Eve and our own family traditions of prayer, feasting with our aunties, our family bonfire, and dinner with my parents and brothers, if they could make it from as far away as the Hopi reservation and Salt Lake City. My firm did some work for the pueblo over the years, so I could slip off and see my parents after meeting with the tribal leaders. On at least a couple of occasions, I appeared before Senior Councilman David Gomez Sr. (my father) and Tribal Administrator Donovan Gomez (my brother). After Dad couldn’t get out to cut wood, due to his declining health, I started buying my parents’ firewood from Olguin’s sawmill and woodyard. We bought so much wood there in the last winter of his life that they gave me a free hat, which of course the dog ate. My final errand with Dad and my son was going to Olguin’s for a mixed load of piñon and cedar one sunny Saturday morning in December 2016. Dad felt so good that we squeezed in another run before they closed at lunch. He was hospitalized two days later, and died after six months in hospice. In going back to Taos for work or for family events, I occasionally have to stay over. One of my favorite places is the Sagebrush Inn, on Paseo del Pueblo Sur, which has a comfortable old-hotel feel. My high school history teacher, Louise Blair, and her husband, Ken, owned it for several years. The bar is woody and quiet, they make a nice martini, and there’s a chance that Melody Romancito, who is married to my cousin, Taos News arts editor Rick Romancito, will lend her lovely voice to a Western swing band on a weekend evening. Stray dogs, no matter how handsome or well behaved, will be removed from the bar, however. My Taos is about memories, people and places I know, things I’ve done, and my current touchstones. Taos has a permanence to it, from the living mountain that oversees all to the Río Grande Gorge, cut over millions of years, and the threads of family and community that become more apparent over time. We ourselves change. We graduate from free midnight dips at the Ponce de Leon hot springs to the higher-priced serenity of a day or a weekend at the Ojo Caliente Mineral Springs Resort and Spa. My high school friends, whom the Taos News education reporter once called “the smart delinquents,” have gone on to distinguished careers in law, business, science, and entertainment all across the country. Wherever you come from, your hometown is the place where you have your first job, your first kiss, and your first stabs at independence. Your hometown makes you, it defines you, but it needn’t confine you. I carry Taos with me everywhere I go, and one day I will return for good.